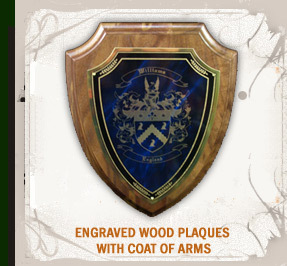 The Tree Maker offers a free coat of arms search for your surname or any other last name that you are looking for. We offer coats of arms from all over the world. We have gone to great lengths to help our fellow genealogist in their quest to find the family crest or other information on their last name. We hope our genealogy website is of help you our customers and promise to work hard to add more names and surname histories to our database. Try a quick coat of arms search for free, to see if we already have the graphics or artwork all ready completed for your family crest. If so you will see an on-line preview of the artwork. If not you can order a preview of a coat of arms for only $9.95 or go ahead and order any number of different products that can be found in our genealogy site. This genealogy website has been design to help our visitors find the products they have been searching for, but for a reasonable price. We hope this free coat of arms search is helpful and would welcome any suggestions you may have for our genealogy company.